Messages. YouTube. Apps from Android Market. One-hand control, drag'n'drop the icons into the corners of your screen - and have your favorites at thumb's reach. Who's there? And who's on the way out? With Timescape™, your friends are closer than ever. Facebook™, Tweets, messages, calls - all in one app, with the latest event at the top. Stuff you didn't know about your favourite stars. Music that brings the house down. Press the infinite button in the media player and go explore. 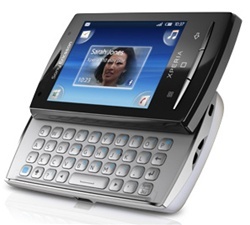 Sony Ericsson Timescape lets all your communication with a person come together in one place. Facebook, Twitter, emails, photos, text messages - all gathered, so you don't have to open loads of different apps to see what's going on. All your comms with your friends via the phonebook. All the artist info you want through the music player. Just touch the infinite button and have it all. Instantly. Your phone keeps you in touch and in sync. Emails, Contacts, Calendar and Tasks, fast and flexible synchronization according to your needs with Microsoft Exchange ActiveSync. Get Email and Messaging. Just enter your email address and your password in the email set-up wizard. Getting email mobile couldn't be simpler. Who's she just broken up with? Where did he get those trainers? 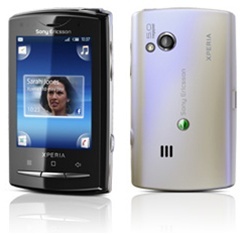 Use the Xperia X10 mini pro to find out. Messaging should be instant. You'll never get lost again. Your phone has built-in AGPS. Location-based services like Google Maps and Wisepilot help you find the way to your destination. Or add location info to your images - use the geo-tagging function. Prefer typing the keyboard way? With full QWERTY, your phone lets you handle your messaging the easy way.